The proposed alternative – a new bridleway in the National Park would be unsafe as it is too narrow to cope with the large groups of cyclists and walkers who currently use the Sussex Pad crossing. It is pretty pointless without a link south to the Tollbridge for which there are no sensible proposals. The current plans show an effective path width of only 2m which is far too narrow to be attractive, let alone safe. An effective path width of at least 4m is required. That the main cycle access to the housing and Lancing is badly designed being routed through a bus stop and crossing lots of roads, making it off-putting and dangerous. Call for a new traffic free route south of the existing access road instead. 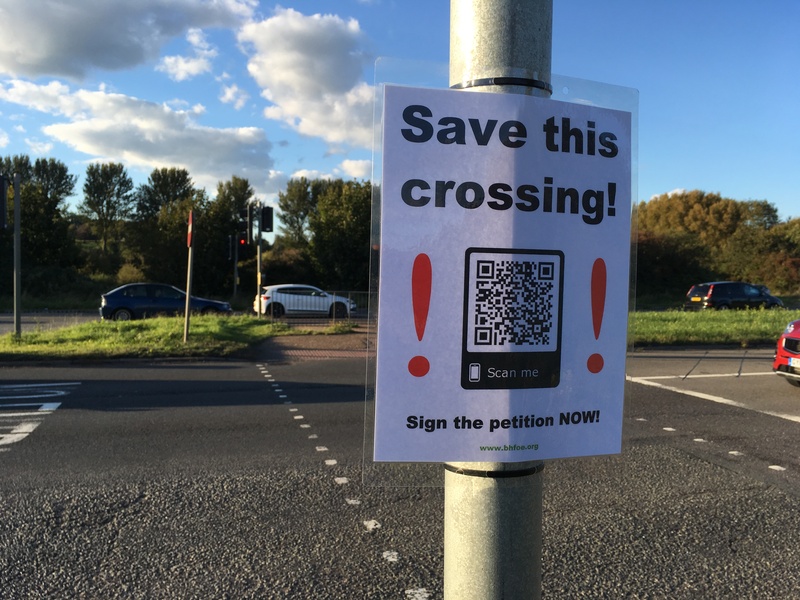 We’ve heavily criticised the plans for cyclists and pedestrians in the New Monks Farm planning application in Adur for 600 homes and a new Ikea store next to the A27. The plans will force pedestrians and cyclists into conflict as the shared paths are too narrow, indirect and potentially dangerous and will put off many from cycling. The cycle route out of the housing estate has 6 stages of road crossing heading east to the Downs Link and Shoreham. Coming back again there are 8 crossing stages. Crossing points are too narrow and central islands too small and will be difficult to get on and off. Anyone taking a child on a trailer or tag-along will find it difficult if not dangerous to use these paths. The Country Park has ridiculously narrow paths and bridges plus a loop that will send pedestrians and cyclists through a car park. The other big impact is the direct and popular crossing of the A27 at Shoreham Pad is being replaced by a convoluted set of crossings at a new roundabout approx 600 m to the west or a sub-standard (too narrow) path along the River Adur and under the A27 before connecting up with Coombes Road. What’s worse is that West Sussex County Council as the highways authority has only picked up one or two minor issues and ignored the fact that the facilities overall are completely dysfunctional, if not dangerous. Is it any wonder that there is so little cycling in West Sussex when you have an authority that cares so little about cycling and public health? Brighton & Hove Friends of the Earth (BHFOE) is challenging Network Rail to start putting the needs of Brighton & Hove above its own convenience. During the May bank holiday weekend, the start of the Brighton Festival and one of the busiest and most important times for the local economy, engineering works will mean there will be no direct trains to London or Gatwick Airport. BHFOE are calling for Network Rail to be made more accountable locally. It believes that Network Rail needs to better understand the needs of local communities and to plan its activities accordingly. BHFOE is pleased that the City Council and local MPs backed its calls to get services reinstated and the engineering works rescheduled. It also feels that GTR and its subsidiaries Southern and Thameslink should be backing the city, looking to put on more services on this busy weekend, not fewer, and challenging Network Rail to do better. Thank you for everyone for coming to our Campaigns Social last week!!! Was a lovely evening and great to see so many people keen to make a lasting change in our wonderful city. For everyone that didn’t come, it’s only up from here! Get involved on the next one. We’re meeting again on the 25th at Kiki’s Cafe, 63a Holland Road, Hove, BN3 1BA. From hearing everything on the night and looking through all the ideas we discussed last week and it’s clear we’re going to achieve some great things. For Air Pollution or Plastics what would the following look like? More information to follow. Looking forward to working together! Are you sick of breathing in toxic fumes from road traffic? Fed up of the plastic waste which blights our beaches and streets? Come along to our campaigns social to join us in improving the city’s environment. Whether it’s the needless plastic waste that our economy produces, the detritus left on our beaches after every sunny day or sporting event or the polluted air we’re stuck breathing every day – enough is enough! Brighton and Hove Friends of the Earth are meeting to combine forces in our response to the issues of air and plastic pollution – working together to create lasting solutions for our city. There’ll be opportunities to hear more about the challenges and solutions around plastics and air pollution and help shape the direction of our local campaigns. We will be offering refreshments and the first drink is on us! To help us plan the event, please let us know whether you’ll be joining us – register here now! The more local voices we hear the better. So, feel free to share the event info with others in your area – the more the merrier. Come along and help improve your local environment.